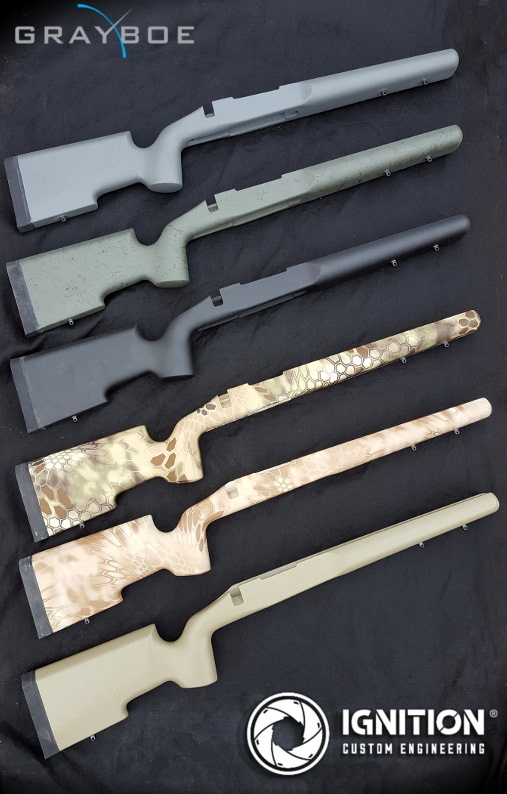 Grayboe Stocks are the latest tactical and hunting lightweight composite stocks to hit the Australian market and boy, are we excited. We are the official Australian distributors for these bad boys. They don’t officially launch until SSAA SHOT Show Expo later this month but we couldn’t resist this sneak preview…. We first got our hands on a Grayboe in mid 2016 after the US product launch. The price tag and lead time was what first caught our eye. Grayboe uses new technology to deliver a top-end quality custom order stock within 3-6 weeks for well-under $1000 AUD. As any excited shooter or gunsmith would, we fitted it to a barrelled action and got shooting. Needless to say, we were impressed. The stock feels stiff and comfortable, is lightweight and easy to work with. It comes with great features from the factory like pillars, paint or Cerakote finish in a variety of attractive patterns, (optional accessories include quick-detach push-button sling loops, swing swivel and picatiny rail). It can easily be bedded for additional accuracy. Currently there are two stock styles available called the Renegade and Outlander (with a third due for release this year). 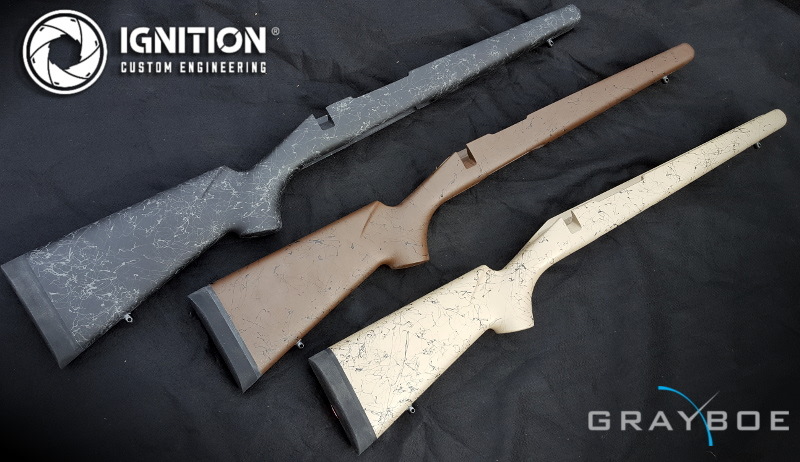 The factory inletting caters for Remington 700 clone actions, however we are working with Grayboe to introduce other inletting options so stay tuned all you Tikka fans. The Renegade stock is designed for tactical or bench rest with a wider foreend, short pistol grip and weight of 1.58kg (3.5lb). The Outlander is the hunting stock solution weighing in at 1.13kg (2.5lb) with BDL floorplate support. It also features a slightly wider foreend to accommodate magnum and sporter barrels. The stocks are the creation of Grayboe founders Ryan McMillan (former Navy SEAL and co founder of McMillan Firearms Manufacturing) and Greg Arthur (USMC and firearms manufacturer). Between them, these two have a huge amount of practical experience and knowledge both engineering and manufacturing firearms components but as proven shooters. Although the product is relatively new on the market, they are the culmination of years of intense research and development. We are very proud to partner with Grayboe as the official Australian distributors and bring these into the Australian market. They will be launching on our webstore later this month. We will also keep you posted on the exciting news as we work on some new options and products together. To find this product at SSAA SHOT Show Expo visit the Ignition Custom Engineering at site 402 (towards the rear of the exhibition near the main stage).